A popular but misleading explanation states that a McGill student, in an attempt to test Harry Houdini's widely known strength, punched the magician in his stomach, thus causing his untimely death. The real story, however, is a little more complex. On October 20th, 1926, Houdini had been visiting McGill University, giving students a presentation on his recent debunking of a Boston medium. Later on after the presentation at least two students came to visit him: Jocelyn Gordon Whitehead and Samuel J. Smilovitz, who decided to sketch Houdini. During the course of the meeting, Jocelyn Gordon Whitehead decided to challenge Houdini's strength and, without warning Houdini, delivered about three non-malicious punches to his stomach. It appears that Whitehead's punch to Houdini's stomach, while not fatal, aggravated an existing but still undetected case of appendicitis. Although in serious pain, Houdini nonetheless continued to travel without seeking medical attention. 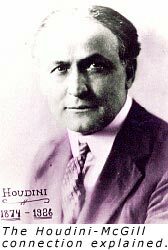 Houdini was visiting Montreal to perform at the Princess Theatre and was invited to McGill by the Dean of the faculty of psychology to talk to students about debunking spiritualism. Houdini was facing us and lying down on a couch at the time reading some mail, his right side nearest us. This first-year student engaged Houdini more or less continually whilst my friend Mr. Smilovitch continued to sketch Houdini. This student was the first to raise the question of Houdini's strength. My friend and I were not so much interested in his strength as we were in his mental acuteness, his skill, his beliefs, and his personal experiences. Houdini stated that he had extraordinary muscles in his forearms, in his shoulders and in his back, and he asked all of us present to feel them, which we did. The first-year McGill student asked Houdini whether it was true that punches in the stomach did not hurt him. Houdini remarked rather unenthusiastically that his stomach could resist much, though he did not speak of it in superlative terms. Thereupon he gave Houdini some very hammer-like blows below the belt, first securing Houdini's permission to strike him. Houdini was reclining at the time with his right side nearest Whitehead, and the said student was more or less bending over him. These blows fell on that part of the stomach to the right of the navel, and were struck on the side nearest to us, which was in fact Houdini's right side; I do not remember exactly how many blows were struck. I am certain, however, of at least four very hard and severe body blows, because at the end of the second or third blow I verbally protested against this sudden onslaught on the part of this first-year student, using the words, "Hey there. You must be crazy, what are you doing?" or words to that effect, but Whitehead continued striking Houdini with all his strength. Houdini stopped him suddenly in the midst of a punch, with a gesture that he had had enough. At the time Whitehead was striking Houdini, the latter looked as though he was in extreme pain and winced as each blow was struck. Houdini immediately after stated that he had had no opportunity to prepare himself against the blows, as he did not think that Whitehead would strike him as suddenly as he did and with such force, but that he would have been in a better position to prepare for the blows if he had risen from his couch for this purpose, but the injury to his foot prevented him from getting about rapidly. As for Whitehead, information provided by McGill University's archives suggests the student was never investigated for any wrongdoing in Houdini's death. As well, a professor of psychology denied that any punching took place after Houdini delivered his lecture at McGill. It's possible, however, that the blow took place at a different time in Houdini's dressing room. In the end, Houdini's widow was apparently the beneficiary of an insurance policy worth $25,000 that doubled if the escape artist's death was deemed accidental rather than from an aggressive action. Her New York lawyers inquired about the Montreal incident, but signed an oath saying Whitehead had no intention of hurting Houdini. Despite Price's first-hand account, much dispute remains over exactly what took place in Houdini's dressing room that day. Houdini's wife Bess, a nurse named Sophie Rosenblatt, and Bess's niece Julia Sawyer were also present, and the details of their stories differ. Did Joselyn Whitehead really show up after Smilovitch and Price arrived, or had Smilovitch brought him along? Was Whitehead really a McGill student, or was he an amateur boxer (or both)? Was he already known to Houdini (as he presumably was if, as some rumors report, he had shown up to return some books he had borrowed from the magician). Did Whitehead really "secure Houdini's permission" before delivering blows to the magician's stomach, or did he mistake Houdini's casual response to his query as permission to proceed and strike before Houdini was prepared? Did Houdini even really boast that he could withstand such punches? Whatever happened, Houdini was definitely suffering from severe stomach pains later by mid-afternoon, although he carried on with that evening's show and struggled through another performance the next day (Saturday). On the train to Detroit (where Houdini was scheduled to appear on Sunday) Houdini was suffering mightily from the pain in his stomach, so a worried Bess telegraphed ahead and arranged for a doctor to be standing by at their hotel when they arrived. Unfortunately, their train was late; the Houdinis had no time to check into their hotel and headed straight for the theatre. The doctor finally caught up with Houdini, examined him in the dressing room, found him to be running a fever of 104, diagnosed acute appendicitis, and proclaimed that Houdini should be taken straight to a hospital by ambulance. Bess allegedly did not hear the doctor's diagnosis, and Houdini supposedly told the worried theater owner, prophetically, "I'll do this show if it's my last." Houdini rushed through his show and was obviously not performing well, and before the third act began he finally decided that he could carry on no longer. (Houdini did not collapse on stage, as is often reported; nor did he have to be rescued from the Water-Torture cell by an axe-wielding assistant, as portrayed in various film biographies.) Even then, Houdini would still not seek medical treatment, returning to his hotel before finally Bess "threw a tantrum" and summoned the hotel physician. The physician called a surgeon, who examined Houdini and told him that he must be hospitalized at once. Still, Houdini demurred, calling his personal physician, Dr. William Stone, back in New York sometime after 3:00 A.M. Only after Houdini and the other doctors had talked to Dr. Stone did Houdini finally relent and agree to be taken to Grace Hospital, where he underwent surgery to remove his appendix that afternoon (Sunday, 24 October). His appendix was removed by a Dr. Charles Kennedy. Houdini remained in hospital for a few more days, apparently getting better at one point and then taking a turn for the worse. In another Canadian connection to all this, Dr. Kennedy concluded that Houdini's appendix must have ruptured sometime on the train ride near St. Thomas, Ont. The odds of surviving such an infection in the days before antibiotics were small, but Houdini gamely hung on for another four days before undergoing a second operation on Thursday, 28 October. He seemed to be recovering by the next day, but on Saturday his condition worsened, and the renowned magician escape artist passed away the next day at 52. Fittingly, the date was 31 October 1926: Halloween. 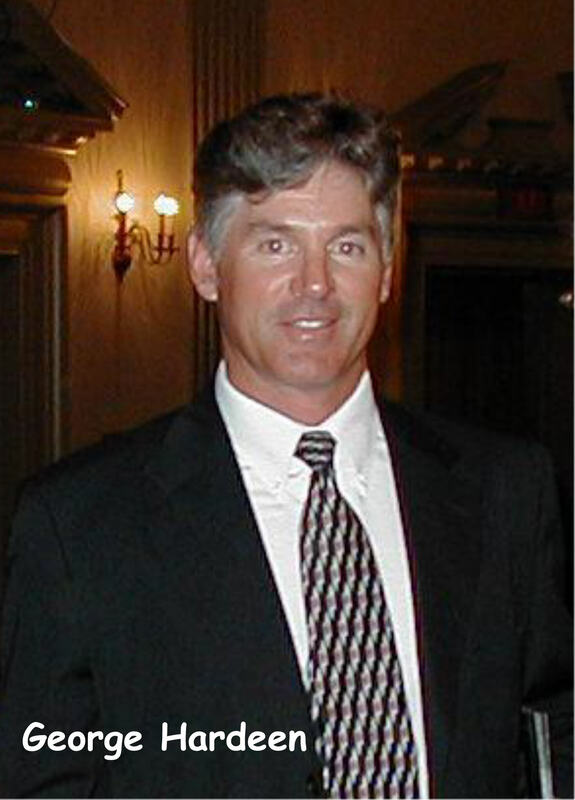 Jocelyn Gordon Whitehead was registered at McGill University in 1926, which places him in the correct time period as Houdini's appearance at the University. However, he does not appear as a graduate of the University. Apparently Whitehead later accepted a job as a religious minister in the U.S. and disappeared into anonymity. In the aftermath of Houdini's death, the assumption was made that the blows to his stomach and his ruptured appendix were related. It seemed a logical conclusion at the time, even to his doctors, and so the legend began. With the advantage of several decades of hindsight, however, we now know this explanation to be impossible: no cases of acute appendicitis caused by physical trauma have since been documented. The blows to Houdini's stomach may indeed have hastened his death, but in a way different than commonly believed: he was likely already suffering from appendicitis at the time Whitehead struck him, and he may have written off his subsequent stomach pain as being caused by the punches he took rather than the appendicitis. Had the dressing room incident not occurred, Houdini might have realized the pain was an indicator that something was very wrong and not delayed so long in seeking medical treatment.